Queen Bee can certainly help expectant mamma’s in the clothing department with its beautiful range of gorgeous, elegant and stylish dresses which will leave you feeling glamorous, glowing and most of all comfortable. Adding these stunning pieces to your wardrobe will keep you still looking adorable. Here are some of our favourites to survive the summer heat - the Aria Maxi Dress has a relaxed nautical feel with perfectly placed pockets and breezy side splits. 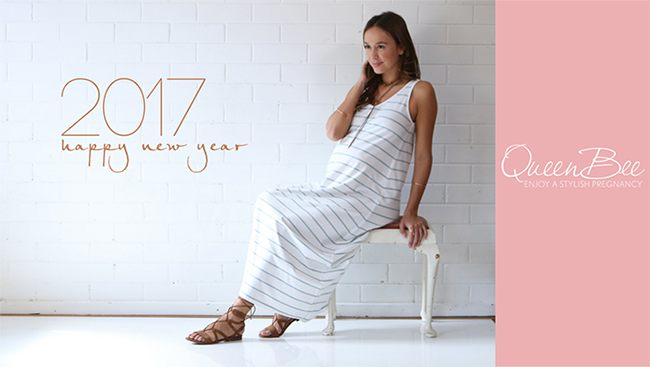 Whether you are heading out to the shops or going to an outdoor bbq lunch, Queen Bee have a range of maxi’s for you to choose from. Our Clinton Grey Maxi dress (pictured above) is a beautiful boho style, in a soft grey marle cotton blend to keep you cool and comfortable. Just add a leather chocker to complete the look. Maxis are great if you are travelling too - our Skylar Maxi Dress (pictured above) has a striking white contrast layer to elongate your figure, plus it has discreet nursing access. Adding comfy shoes such as tan sandals or relaxed flip-flops will definitely help with any possible swelling you might have.